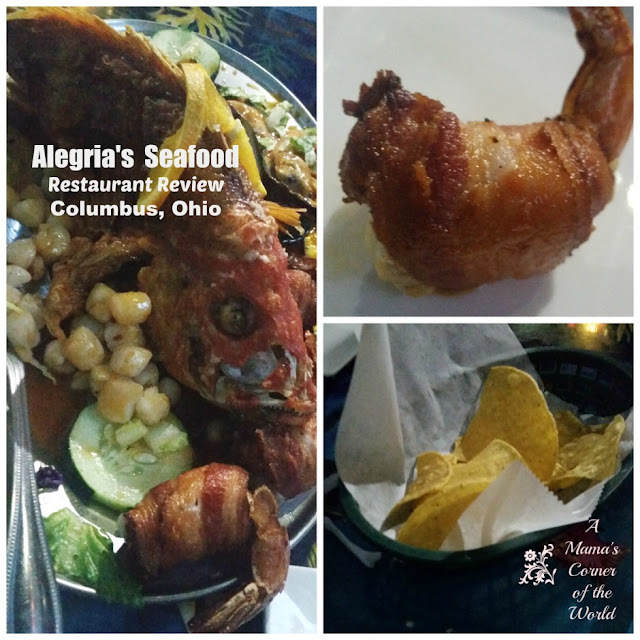 My husband and I have talked about visiting Alegria's Seafood on Bethel Road in Columbus for a few months now. 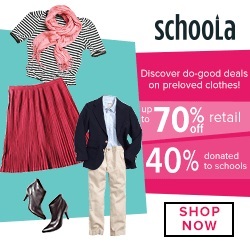 We have seen photos, we have read reviews--and we have seen a few local coupon offerings. Our youngest daughter loves seafood in any form from raw to prepared in a variety of ethnic styles. Our middle daughter won't go near any seafood in any form. Ever. Period. So--a recent weekend found our middle daughter away for the weekend--and us with a Groupon coupon for Alegria's Seafood. 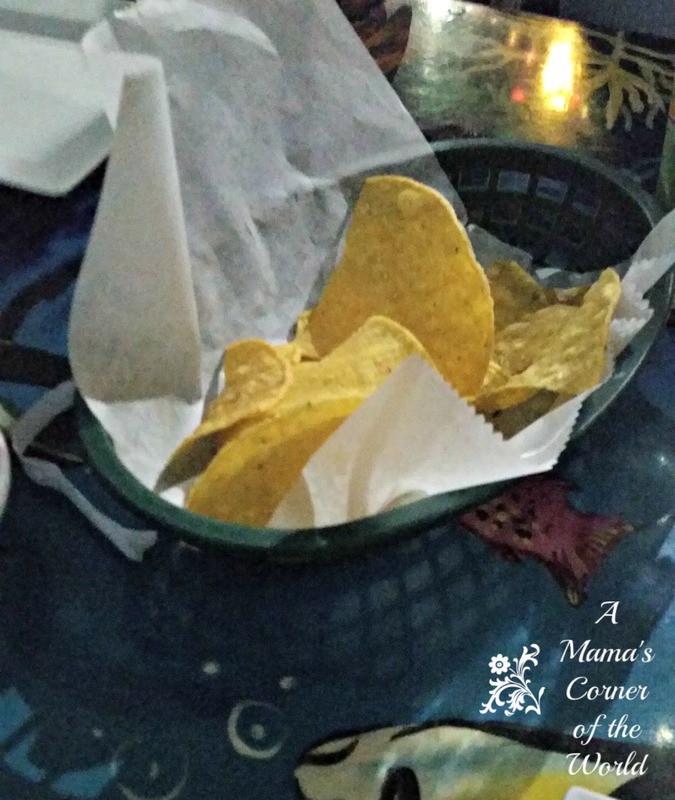 What did we think of Alegria's Seafood and their seafood platters? First--let me tell you a little about Alegria's Seafood. The family operated restaurant holds a pretty busy, strip mall location on Bethel Road in Columbus. This restaurant serves to bring Mexican coast inspired, "beach hut" seafood to our non-beach, non-familiar, fairly isolated, Central Ohio area. In the middle of Ohio's winter--we had some reservations. BUT. The site promised a diverse seafood menu suited to a range of tastes--and we were sucked in by the photos of the red snapper. Really. We had to go! What did we Think of Alegria's Seafood's Location? Strip mall, "hole in the wall" style restaurants often get an undeserved, bad-rap. After 15 years of family travel--we have discovered that these restaurants are often the BEST. So--we were actually encouraged by the fact that we had a tough time finding parking in the strip mall parking lot on Bethel Road! What about Alegria's Seafood's Atmosphere? We made an online reservation because we sort of assumed that a Saturday night dinner visit may find the restaurant busy. When we walked into the restaurant..we were sort of perplexed. There is no "waiting area" as the actual restaurant seating space is pretty small. There is no sign saying, "wait to be seated". There wasn't a hostess visible for a couple of minutes. The dining area was literally full. We had reserved seating online--and the hostess did appear to let us know that she was clearing a table for us. (We were literally standing inches from two tables of diners eating their meals while we waited several minutes for her to clear a nearby table. ) There was a couple who arrived shortly after us--and they weren't even acknowledged until after we were seated. They were shrugging to each other--so I am assuming that they didn't know why they weren't being seated or put on a list for nearly 4-5 minutes. In reality, I'm not sure I would have stayed without being at least acknowledged in some way by staff--so this put a little concern in the back of my mind about service. Luckily, that was quickly dispelled. How was the service at Alegria's Seafood? As I mentioned, we had a Groupon coupon. Our coupon was for $50 worth of seafood platter items. This means that you order drinks and appetizers--and maybe side dishes from the regular menu--but, that they bring your table an iPad from which to order your "Groupon special", $50 seafood platter items. Some of the seafood platter items showed prices on the iPad screen...some of the item descriptions were too long to show the price--so it wasn't possible to easily calculate our platter order. We knew that we wanted the red snapper. We knew that wanted the mussels--but, we couldn't see the prices on either one--so we didn't know what else we wanted. This is where the quality of service saved the day. Our server came and. literally, made some recommendations and helped us price and complete our platter order. She suggested the bacon wrapped shrimp--and that was a group favorite! How was the food at Alegria's Seafood? This is what matters most, right? How was the food? We received some complimentary chips and salsa. One tray of chips. One bowl of salsa. No offers of more--so this isn't your typical, American Mexican restaurant--but, the salsa was good, the chips were warm and fresh and they arrived quickly! A few of the tables around us had the Cantarotes. It was moderately sized--but, it was also $15 a drink. We had Mojitos--and found that the bar staff was pretty liberal with the alcohol in the mixed drinks. The drinks were good, they were well mixed--and, when we return, we may have to try Alegria's specialty drink options! Ordering the seafood platters via our Groupon coupons kept us from actually sampling the restaurant's menu entree offerings. This was a first--as usually a local Groupon gives us a discount off a regular menu purchase. The servers literally brought us an iPad--and took away the menus. This was a disappointment as we had originally planned an appetizer order--but, were sort of shuttled to an "oh, never mind--you belong here" realm. We chose a Large Red Snapper, 4 Bacon Wrapped Shrimp, Mussels, and Scallops with the Nayarit Style sauce. The platter arrived. The presentation is probably not for everyone. I sent a picture to a friend and one to my middle, non-seafood-loving daughter. Friend said, "OMG! It has eyes!" While, my middle daughter said simply, "Ew. No." 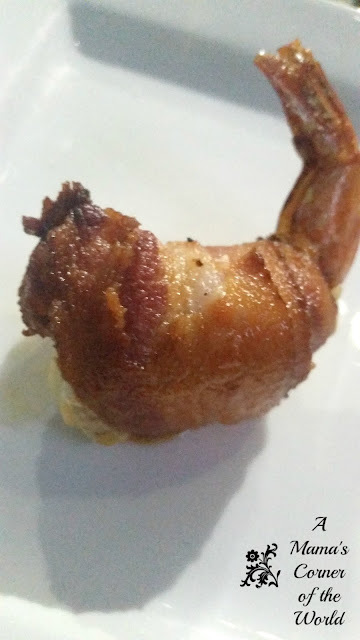 The Bacon Wrapped Shrimp was literally probably the best piece of seafood I have had in a restaurant. Ever. I don't know where the bacon comes from--or how the pieces are cooked--but, if you go to Alegria's--you need to eat this dish. Period. Even if you have to ask for it "off the menu". It's awesome. The Mussels. 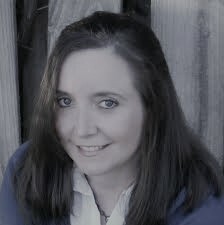 I liked them--but, I didn't love them. The sauce didn't hide the "of the water" flavor for me. The husband and the youngest daughter loved them. I let them have mine. I would need a spicier, stronger sauce for these next time! The Scallops. The daughter and I thought ours were a little under cooked--but, the husband thought they were just fine. Miss Lynnie and I didn't find the mussels firm enough or seasoned with enough of the sauce to mask the texture. The Large Red Snapper. Okay. When this guy arrived with eyes, teeth, fins and all--I swallowed hard. I am always up for new experiences. But--this experience was looking at me. Literally. And--I looked at the husband and said--"Um--How does one eat this..Exactly?" He met my gaze, shrugged, and said--"I don't know...but, it looks like it's cut on the sides." I flipped Mr. Snapper Guy onto his side--and there were scores where cuts had been made down the fillet during the cooking process. Youngest daughter dropped a cucumber over the fish's eye (so he was no longer staring at me). We began to lift chunks of meat from the snapper to our plates from both sides as we "cleaned" the fish bones. This is where that "beach hut in Mexico" experience kicks in a bit. 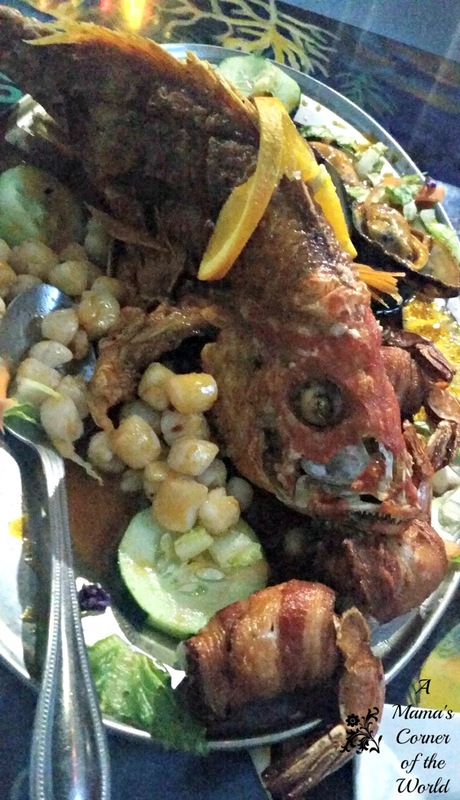 Most of the time, in the states, we aren't served seasoned and grilled "whole fish" for our dinner. Instead, our meals are usually "processed". It's neat. With all the "dirty work" done for us. Not so much at Alegria's. And--that's what I really liked about it. **There were times when we found fish bone slivers in our mouths as they were very thin and small--even in the pre-scored portions--so, if you are dining with little ones, plan to really dissect the meal for them! 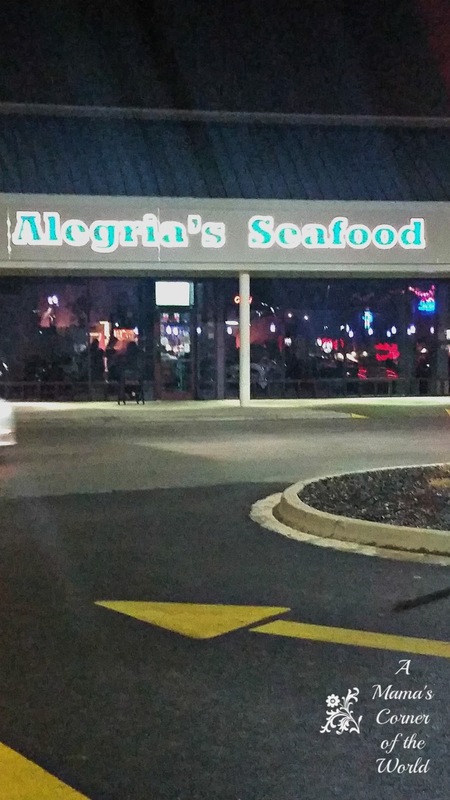 Would I recommend Alegria's Seafood on Bethel Road in Columbus, Ohio? We have had the pleasure, often, of seafood over the past several years. When my husband called Alegria's the best seafood in the Midwest--it said something. The Red Snapper was awesome--and I would certainly deem the bacon wrapped shrimp our best local seafood find in years. The restaurant is small and service is paced a little slow. However--we do plan to return to check out the regular menu as soon as we have the opportunity! Reserve a Table. Book a table online or call the restaurant during busy nights as there is literally nowhere for your party to wait indoors! Plan to Slow Down. This isn't a rush/rush/rush sort of dining experience. 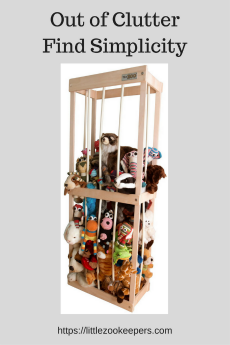 The servers are very attentive--but, they are not going to be at your table every 2 minutes. The pace is a little slow--so relax and slow down. It's Family Friendly...But.. There were several children dining there--but, I do not recall a separate kid's menu offered. The sauces and flavors and meal presentation are a little different than what some children may be accustomed to seeing and tasting. I did see a couple of families bring in outside food for their younger children. I didn't see an "outside food okay" policy--so, I would ask beforehand. The atmosphere is lively and family friendly--but, I think it's best suited for seafood loving families.